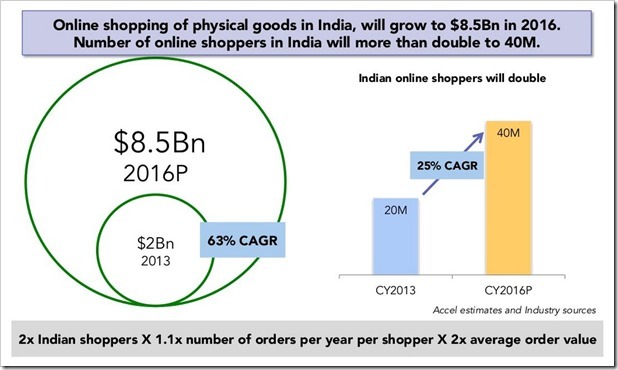 Indian E-Commerce Stats: Online Shoppers & Avg Order Values To Double In Next 2 Years! Indian E-Commerce space is growing rapidly. Infact, it is a reached a stage where consolidation is starting to take place. Flipkart last month announced that they have crossed 1 Billion sales, while Snapdeal is expected to reach the milestone soon. The growth in Indian ecommerce has been such that they have achieved this figure 1 year earlier than expected. Now, Indian leading Venture Capital firm Accel Partners has released an in-depth study of Indian ecommerce space, according to which Indian ecommerce will quadruple from a $2 billion Industry in 2013 to nearly 8.5 Billion by 2016 at a CAGR of 63%. At the same time, the number of Indian shoppers online will grow from 20 million to 40 million by year 2016. The biggest aspect that will please Indian ecommerce players is that it not just the increase in number of shoppers, but the average order value is also seeing a steep growth. According to Accel Report, in 2012, the avg physical goods ecommerce order value was Rs, 1080, which increased to Rs. 1860 in 2013. By 2016, it is expected to nearly double to Rs. 3,600. As the ecommerce space is maturing, Indians are now comfortable buying high priced goods online. Another key aspect that ecommerce companies are going to encounter in next couple of years is growth of shopping on Mobile. It will grow a whopping 27 times compared to 2012 levels and nearly 3.5 times that of 2013. – 35 percent of online sales in 2016 will be influenced by women, a growth of 24X compared to 2012 levels. – Cash of Delivery will remain the most popular method for payment, however, it will come down from 60 percent in 2013 to 50 percent in 2016. 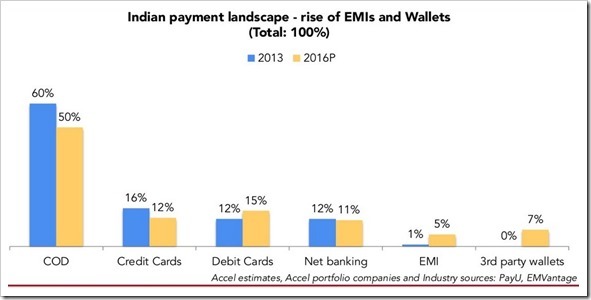 Debit card payments, EMIs and 3rd party wallet get more popular as compared to today. – Adoption of eCommerce is much faster in Tier 2 cities as compared to Tier 1. – Online sales still comprise of a very small percentage of total goods sold. For eg: Only 4 million mobiles were sold online compared to 243 million in offline category. Except Books (7%), all other categories have much lower percentages (less than 1%) of goods bought online. Organized online retail is still only a fraction (0.3%) of overall retail market in India. – By 2016, the conversion from visitors to buyers will stand at 2.90%, a little higher than 2.70% in 2013. 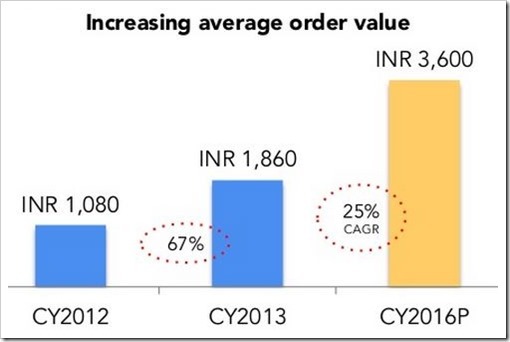 "Indian E-Commerce Stats: Online Shoppers & Avg Order Values To Double In Next 2 Years! ", 5 out of 5 based on 1 ratings.